Remembering Columnist Molly Ivins Liberal political columnist Molly Ivins died yesterday at the age of 62. In her long career, she wrote for newspapers such as The Texas Observer and The New York Times, and her columns were widely syndicated. These interviews originally aired on Oct. 3, 1991 and Oct. 7, 2003. Liberal political columnist Molly Ivins died yesterday at the age of 62. In her long career, she wrote for newspapers such as The Texas Observer and The New York Times, and her columns were widely syndicated. These interviews originally aired on Oct. 3, 1991 and Oct. 7, 2003. 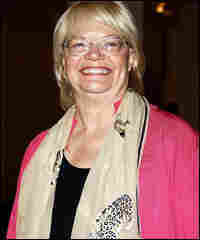 Syndicated columnist and best-selling author Molly Ivins has died of breast cancer at the age of 62. As editor of the Texas Observer during the 1970s, Ivins became famous for her biting wit as she chronicled the political antics of the Texas legislature. A liberal who often skewered the political establishment, Ivins wrote a book about President Bush titled Shrub: The Short but Happy Political Life of George W. Bush. It became a best seller. Ivins became famous writing about Texas, but she got her early seasoning in Minnesota as a police reporter for the Minneapolis Star Tribune. She then made her name in Texas as an editor for the Observer, an independent political journal. "I never saw anything funnier than Texas politics," Ivins once said of her time covering the good-ol'-boy networks of state politics. After Ivins became a syndicated columnist, her work appeared in 300 newspapers. But her writing about President Bush brought her an even larger audience as a best selling author.